A unique ingrown toenail home treatment using a toenail brace that corrects unhealthy nail curvature — the source of ingrown toenail pain. Most users eliminate ingrown toenail pain in just a few days. Independent studies demonstrate treatment success comparable to surgery. Use CurveCorrect for 90 days. It works or get 100% of your money back. CurveCorrect takes a modern approach on ingrown toenail treatment, using a flexible composite toenail brace you apply at home. The brace behaves like a spring. It gently lifts the side of your toenail, reducing its pressure against the toe. The CurveCorrect Ingrown Toenail Kit is a unique and incredibly effective way to treat ingrown toenails, curved toenails, curling toenails, ingrown fingernails, mild pincher (pincer) nails, incurvated toenails, involuted toenails, onychocryptosis and paronychia. How does it treat ingrown toenails? You apply the ultra-thin ingrown toenail brace to your nail. The brace behaves like a flattened spring. When it's bonded to the curved surface of your toenail it applies a gentle force that straightens the nail. Pressure from the side of the toenail is eliminated. Ingrown toenail pain is reduced immediately and eliminated by the first week. Chronic sufferers should apply a new toenail brace monthly through a complete nail regrowth cycle, while for others just 1-2 applications are enough. CurveCorrect contains 10 toenail braces. Will it fix MY ingrown toenail? Yes. Unless your toenail is very thick it will provide complete treatment of painful ingrown toenails and dramatically improve the appearance of your toes. Thickened or rigid toenails are resistant to the corrective forces of the toenail brace. Is it a permanent ingrown toenail treatment? Yes. Studies show that following our plan and properly caring for your toenails after treatment will prevent ingrown toenails from returning for 92% of users. Proper toenail trimming and wearing shoes that allow enough room for your toes will help prevent recurrence. No. You can go about your normal activities within a few minutes of applying the ingrown toenail brace. Women can apply nail polish over the brace, however because the brace is so thin and transparent it's nearly invisible against your toenail. Yes. This treatment is known medically as Orthonyxia or ingrown toenail bracing. It's practiced worldwide by physicians and nail professionals. There's no cutting, drugs or toxic chemicals involved. The toenail brace can be removed anytime. CurveCorrect Ingrown Toenail Home Treatment is a truly unique and incredibly effective way to treat a variety of conditions associated with a highly curved toenail. 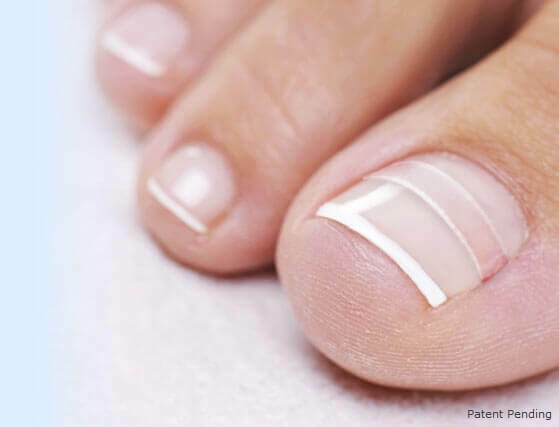 These conditions include ingrown toenails, curved toenails, curling toenails, incurvated toenails, involuted toenails, mild pincer, trumpet or omega nails, ingrown fingernails, onychocryptosis and paronychia. Painful ingrown toenails are the result of a toenail that's become too curved. The obvious solution is to correct the curve of the toenail, a different approach not achieved using any other ingrown toenail treatment, not even surgery. CurveCorrect straightens curved toenails, lifting each side and reducing its pressure against the skin. Whether you've had ingrown toenails for many years or if this is your first experience with an ingrown toenail, CurveCorrect will eliminate painful toenails in just a day or two. Used over time, studies show it can completely eliminate chronic ingrown toe nails with a recurrence rate of just 8% after 10 months. Over 97% of our customers report being satisfied (many overjoyed) with their results using CurveCorrect - you will too. Be sure to visit our feedback page where users have shared their experience. If you have any questions please send us an email or you can ask the community. CurveCorrect has been in operation since 2008. We pioneered nail bracing for home use. Our greatest satisfaction is helping you eliminate pain.